Beautifully upholstered bedstead with a deep buttoned headboard, colour only as shown in plush mushroom, and available in 4’6, 5’0 & 6’0. A striking headboard delivers a sense of grandeur to this alluring design, combining beautifully with the soft-edge contouring of the base. A striking sleigh bed presented in a sumptuous silver crushed velvet. 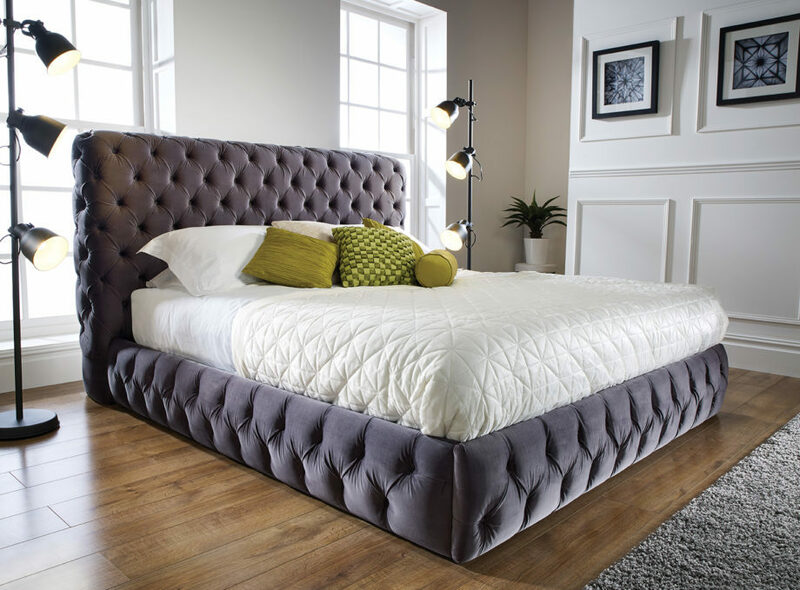 It is a substantial bed characterised by exquisitely finished, luxurious upholstery and an imposing deep buttoned, high headboard with matching footboard. Two large under bed drawers add a phenomenal amount of storage space. Verona adds a wow factor to any bedroom and is a perfect match for traditional and contemporary interiors alike. A sprung slatted base ensures extra comfort and prolonged mattress life. An Opulent bed finished in either Mink or Soft Grey Velvet fabric. Stunning diamond stitch pattern and refined curved frames, make the Montreux bedstead a real eye catcher. Beautifully painted wooden base in either soft grey (as shown) or urban grey, compliment the soft wool feel headboard. Available in 4’6″ & 5’0 options.